Oh this old thing! No, really. This outfit is old in clothing years. Well, the core of it at least. And that makes me proud. As I mentioned in yesterday’s post this pile of knitted pizzazz is beyond a toddler and makes an appearance a few times each season. Due to it’s light weight fabrication and neutral color I rock this at least once a month during the summer, fall, winter and spring! It’s just that good. But I won’t harp on it too much since you can’t score this exact one for yourself. My apologies. However, to make up for it- yesterday’s post has 10 styles that embody what this piece is all about and 2 of them are ringers for this exact design. We know I am not reinventing the wheel by saying my old sweater and old jeans are given new life thanks to these modern accessories. That’s what accessories are for- the personal touch to make a look your own. The real MVP being the footwear, amiright?! I am just living for all these fun accents, like tassels and pom-poms. This just goes to show- mixing up your tried and true faves with a splash of the exotic can totally have some kickass results. This outfit works for a ton of situations from grabbing drinks at happy hour to a low-key birthday party, to date night etc. So, as you get ready to stock your closet with fall’s latest trends go through what you own and see what you can bring back to life. I bet you have more than you think! If you discover some gems that you are going to make new again, you know the deal- let me know! 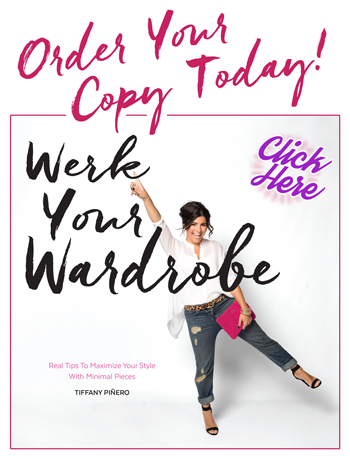 Share here: @TiffanyPineroStyle on instagram |@TPineroStyle on Twitter |\TiffanyPineroStyle on Facebook! You are too gorgeous girl! Please dress me every single day, always…k-thanks. ?